In some cases, you could be able to hear rattling sounds generated by termites. When they feel threatened, these insects rattle their heads against tunnels, creating a very distinctive effect. You can also keep listening for clicking noises and rustling sounds, as they go through the wood. 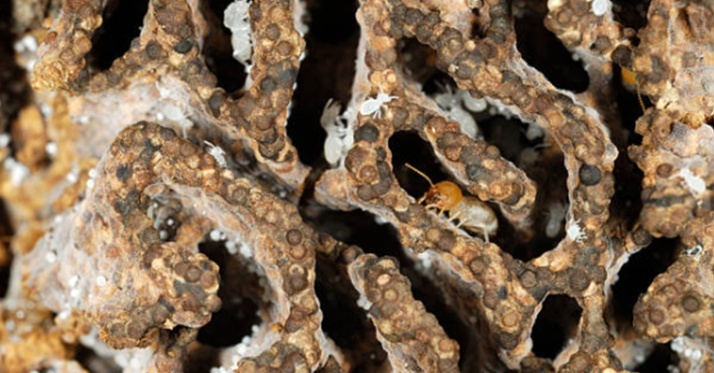 During the day, most termites swarm, to detach from their “group” and finding new areas to colonize. Winged termites, which are common household parasites, are particularly keen to follow electrical light sources, including lamps. You might be able to easily spot them flying around a light bulb during the day, or even at night, depending on the type of termite. Even if you might not see termites directly, you might be able actually to see what they leave behind. Termites wings and feces might pile up in the corners of your home, behind furniture and in other areas that are not as easy and immediate to access. Always make sure to inspect for these indirect signs of termites.